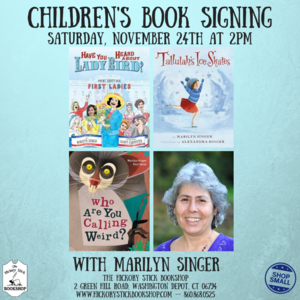 As part of their Small Business Saturday celebrations, The Hickory Stick Bookshop will host a children’s book signing with critically acclaimed author/illustrator Marilyn Singer who has three new picture books for kids out this Fall: Who Are You Calling Weird, Have You Heard About Lady Bird? Poems About Our First Ladies, and Tallulah’s Ice Skates. The signing will be on Saturday, November 24 at 2 p.m. Celebrate the weird, wonderful, and downright bizarre in this compelling compendium of unusual animals. From the green fur of a three-toed sloth, to the pink and wiggly appendage of the star-nosed mole, there’s something new to marvel at on every page. Come face-to-face with the most curious creatures from across the globe, and decide for yourself who’s the weirdest of them all. Marilyn Singer is the author of more than 100 books for children and young adults, including Rutherford B., Who Was He? : Poems About Our Presidents; Feel the Beat! : Dance Poems that Zing from Salsa to Swing; Mirror Mirror; Echo Echo; and the Tallulah series. She lives with her husband and a variety of creatures in Brooklyn, New York, and Washington, Connecticut. Visit her at marilynsinger.net. This event is free and open to the public. If you are unable to attend, you may reserve a signed copy of Who Are You Calling Weird, Have You Heard About Lady Bird?, and/or Tallulah’s Ice Skates by calling The Hickory Stick Bookshop at (860) 868 0525.